Here is the left side. I used some cards from the Project Life Aqua Edition. This is such a bright, happy core kit. I may have to splurge and purchase a whole kit instead of the 1/3 kit I purchased last week. Here is the right hand side. 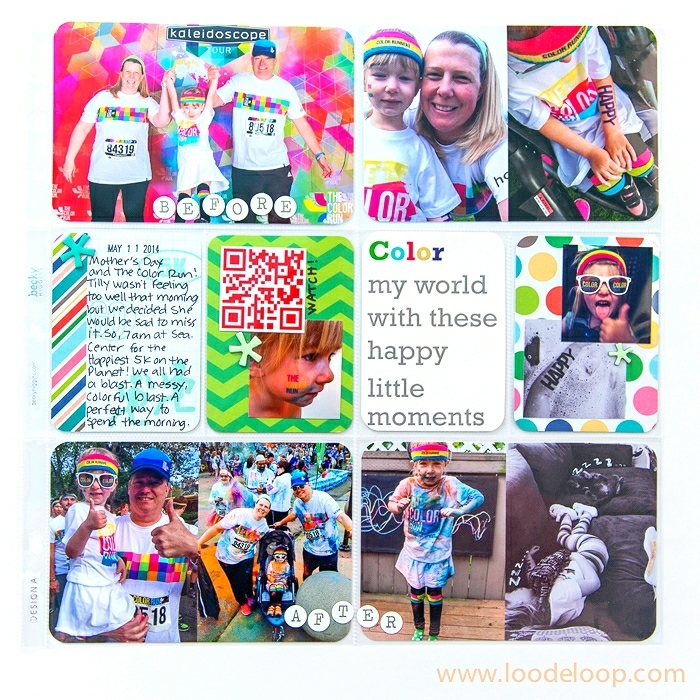 All the photos are dedicated to The Color Run we did on Mother's Day. And yes, another QR code. This video is of our Color Run experience. And that's a wrap for Week Nineteen. Does anyone need a tutorial on including QR codes in your Project Life albums? Perhaps I'll write up a tutorial for next week. I would love it if you explained the QR code! Great layouts Thanks for sharing. Thanks, Coral! I'll work on that post for this week. Thanks for stopping by! Awesome Layout. I just did the color run today with my daughter. Is the 2x3 Color my world card with these happy little moments from Aqua? We don't have Aqua yet in our stores but I can't wait! Thanks for sharing.